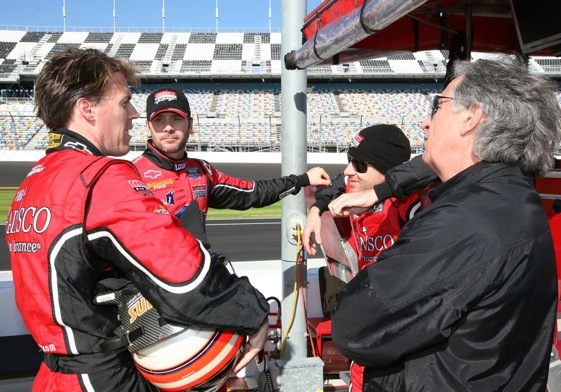 Chances are, you are having an easier week than are the drivers for the GAINSCO Racing Grand-Am series team. In terms of physical comfort, at least. Because the days leading up to the start of the Rolex 24-hour race at Daytona International Speedway, represent hell week for the GAINSCO guys who are following an event-preparation program set up by John Sitaras. It’s a week of gut-busting work and a seriously restricted diet. Hopefully, the debate about whether or not race car drivers are athletes lies a-moulderin’ in its grave; struck down by facts, testimony and common sense. 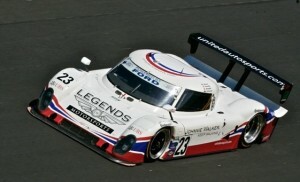 Driving, turning and braking race cars which are traveling close to 200 mph takes strength, coordination and endurance. Even when the cars are going around ovals. More so when the cars are on road courses. And especially so when the race is on a road course and lasts 24 straight hours. Most drivers competing in the Rolex 24 this weekend haves used the weeks and days heading up to the event to get into the kind of shape required to race twice around the clock, even if they are sharing duties with three or four others. Some of their training regimens are kind of traditional. British driver Martin Burndle, for example, said this week that his former trainer – Tom Ryan – had him work out on a heavy bag because many of the muscles which drivers use are the same ones which boxers use. Ryan was later hired by the Tom Walkinshaw Racing team, which made its debut at Daytona in 1988. The GAINSCO guys are taking a more modern approach – thanks to Sitaras. Sitaras is a highly regarded personal trainer based in New York City. He is big into taking a scientific approach to fitness. His methods apparently work rather well for race-car drivers. Jimmie Johnson is a Sitaras guy and he has won five straight Sprint Cup championships. It was Johnson who turned the GAINSCO team onto Sitaras’ methods. “Well, you know,” Gurney said, “I kind of do a normal routine in the off-season to stay fit. I’ve been racing my simulator quite a bit at Daytona on the iRacing which is a lot of fun, I get a lot of fun out of that just trying to whittle down my lap times and play with the setup. During a phone interview this week, Sitaras provided more detail on the pre-24 plan he has laid out for Johnson. Sitaras said that to begin with, Johnson is in tremendous shape. Stays in tremendous shape all the time and is a workout fiend. So, his pre-24 program is a bit different than he might design for others. This race week, Johnson’s regimen revolved around keeping the major muscles Johnson will use in shape because fatigued muscles will mean a lack of focus and that just doesn’t work in auto racing. Basically, the plan was to work Johnson hard early in the week and limit his intake of carbs. On Friday, Johnson was scheduled to be up at 5 a.m. He was scheduled to run two excruciating 30-second, all-out sprints. Then, it was time to load. Ryan, too, had the Walkinshaw team hit the carbs on the Friday before the race. But the way Brundle put it sounded much more pleasant than what Johnson is having to go through. He said the team, crew members and all, could count on shepherds pie courtesy of the team nutritionist the night before the race. For Johnson, once Saturday – race day – rolls around, “all he has to do is show up,” Sitaras said. During the race, when not in the car, rest is key. Get as much as possible. On Monday after the race, Johnson used to spend the day on the coach. “Wouldn’t be able to move,” Sidaras said. Sidaras issues the don’t-try-this-at-home warning. He said months of studying the individual goes into his programs. This is not a one-size-fits-all training method. But, it appears to work for Johnson and the Gurney hopes it works for him and the rest of the team. But then again, Ryan’s methods paid off with a Rolex victory for Brundle and the TWR team in its debut year of 1988. So you are saying if a driver had 2 Baby Ruth’s,a couple of Cokes and a pack of Lucky’s in him……he couldn’t take a 1966 Holman Moody Mark II GT 40 to the front? They ran 1-2-3- at Daytona 24 on that and maybe a go go pill.